Ya'at'eeh! Welcome to Winslow Indian Health Care Center! 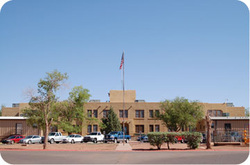 We boast an outstanding and innovative ambulatory health care center that serves an estimated 60,000 Native Americans, most of whom are Navajo. In addition to our ambulatory services, we offer a vast amount of resources to our patients to ensure they receive health care to the fullest extent. Winslow Indian Health Care Center leads the way in health care excellence. We are committed to providing only the highest quality services, which are supported by an elaborate medical staff as well as a progressive electronic health record data system. We strive for continuous improvement, with our goal and intent to raise the standards of health care within the Navajo Nation. Operating on a family medicine model, WIHCC provides health care services to all Native Americans as well as their beneficiaries and dependents. health care. To further support the concept of traveling health care, we also have a 37’ motor home, which has been appropriately dubbed the “Happy Healthy Life Van,” and is part of our Health Care on Wheels Program. Our culturally diverse doctors, nurses, and support staff all share the same philosophy: WIHCC isn’t just a place to work or receive medical care. We’re a family, and we’re proud of the long-term relationships we enjoy with our patients and our staff members. We look forward to continued growth and development of our family.